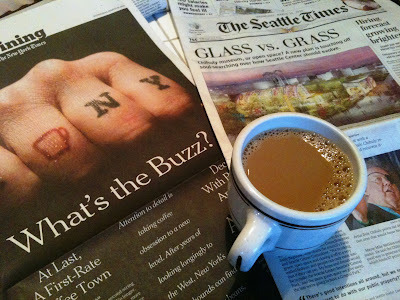 It was all about “cawfee tawk” with the morning papers today (read, deliciously, alone at my dining table). I mentally toyed with the idea of turning Seattle Center’s former Fun Forest into a Chihuly glass museum, turned to my friend Danny Westneat, who tawked about big-paycheck health insurance honchos, and considered the “Sophie’s Choice” facing the Seattle school system. Then I treated myself to a strong gulp of the NYT food section, proclaiming NYC as (finally!) a first-rate coffee town. In addition, the outtatown paper dished the deets on designer decaf and offered up a coffee-lover’s lexicon (“A” is for affogato, “R” is for ristretto). Which I enjoyed as I sipped my outtatown coffee (“P” is for Peet’s) made in the comfort of my kitchen (“C” is for Cuisinart DCC-1200). And now that I’m feeling the buzz, I’ve got to ask: What kind of coffee did you drink this morning, and where did you drink it?